Kat Got The Cream is an Etsy shop run by clothes maker Kathryn Sharman. Made in the UK each handmade piece is designed to be pretty and practical to have both comfort and style. Kat's range includes pieces for both boys and girls in a wide range of sizes. Pieces can be bought in co-ordinating or mix match sets. Kat is giving away a £30 gift voucher to use on anything in her shop. To enter just complete the below and good luck! The giveaway will run for two weeks and the winner will be drawn on the 18th of March. Love bandana bibs for my little man! I love the chambray button trousers!! http://www.etsy.com/listing/121439954/blue-gingham-bloomers-6-12mths-1-2yrs-2? These are so cute!! 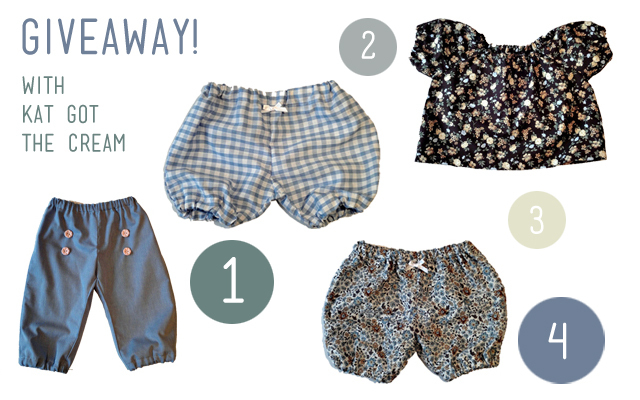 The Blue Gingham Bloomers are my favorite! I've been coveting these for a while - these bloomers are my favourite! I love these pants. So cute! http://www.etsy.com/listing/121802561/chambray-button-trousers-6-12mths-1-2yrs? Oh my word.. those bloomers! AH! Chambray Button Trousers. Killing me with cuteness!